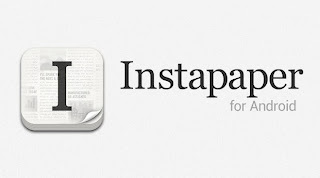 Instapaper for Android: There goes the neighborhood. Get ready for much tearing of hair and gnashing of teeth -- another iFan shibboleth has joined the dark side. And at a $2 discount. "A simple tool to save web pages for [...] later offline reading, optimized for readability on your tablet or phone's screen. Critically acclaimed by top blogs, newspapers, and magazines!" As released for iOS, Instapaper is a 'reader' app bundled with a browser extension. Together, they let you 'save' (bookmark) articles or the text from web pages for later, off-line viewing. 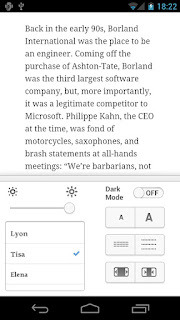 Despite a sparse interface, Instapaper still packs in lots of convenience options plus the all-important ability to sync across multiple devices. But Instapaper's appeal becomes clear only when using it. Click on an article and you are magically presented with simple, bare text; no ads, images or oddball formatting to get in the way. Feel free to choose your favorite font, text-size and display lighting. Or invert the text (white on dark), for less eyestrain when reading at night. To help make reading an immersive experience, Instapaper for iOS has built-in utilities for sharing and discovering ...all without leaving the app. It's this full spread of handy features that set Instagram apart from the iOS competition; their combined effect creates a comfort zone that faithful users delight in and have come to expect. Instapaper for iOS. Accept no substitute. At first, the Android version promises familiarity. Just as with iOS, you get easy access to the Settings menu as well as the usual Edit options. Below these are prominently displayed the basic 'Read Later', 'Liked' and 'Archive' Instapaper menu-options, exactly where they should be. And that's where things start go astray. 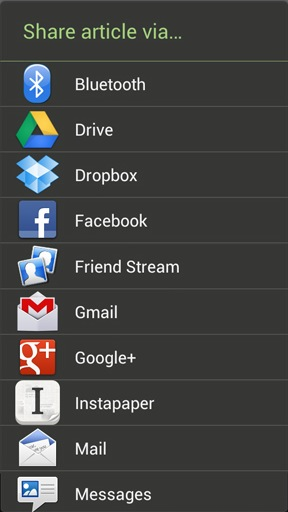 Unlike it's iOS counterpart, Instapaper for Android has no 'Friends' sharing utility. Ok, so you'll use GMail -- whatever. But it also lacks 'The Feature' recommendations engine and 'Web' for finding new articles, You don't even get the ability to 'Search' all of the articles and pages you've archived via Instapaper's subscription service. The bigger the screen, the bigger the UI bars. Worse, there's no full-screen display mode. Try as you might, UI elements are always visible along the top and bottom edges. 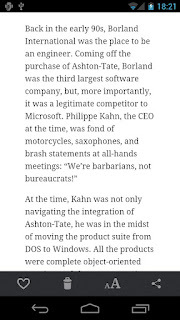 And in what strikes us as a peculiar gambit, Instapaper for Android also does away with animated pagination ...a very popular gimmick, the loss of which will likely annoy many users (tho' not MobilePhonesFan). To be clear, we're not suggesting these flaws are deal-killers. All of the missing features can be got 'round with minimal user-input. To improve user experience, iPhone devs sometimes integrate custom workarounds for iOS' limitations viz background processes. But Android's multitasking and native intents obviate most such concerns. These are 'intents'. Now you know. So, then, let's count our blessings, shall we? 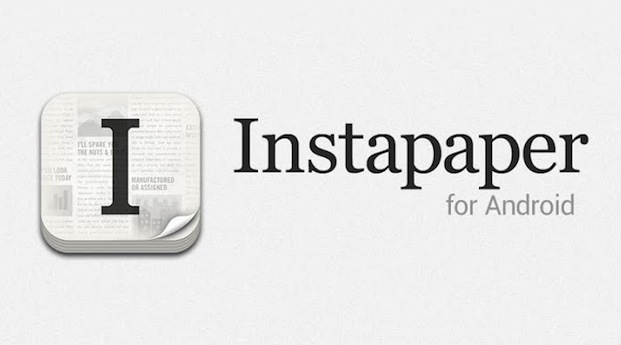 Instapaper fans who are also Android users now have an official client of their very own. 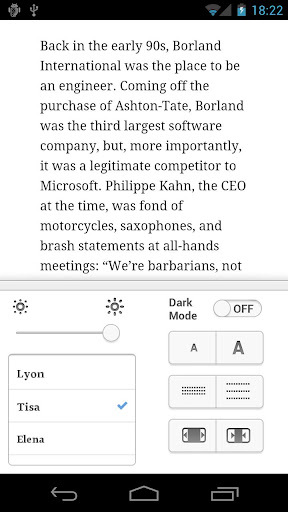 It joins some very fine 3rd-party apps that use Instapaper's public API, which means more choice for app buyers. Google's notoriously chaotic Play Store gets a crown jewel, plus a small measure of hard-won recognition for Android. 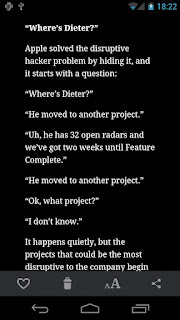 Make no mistake, that last part is a big deal. 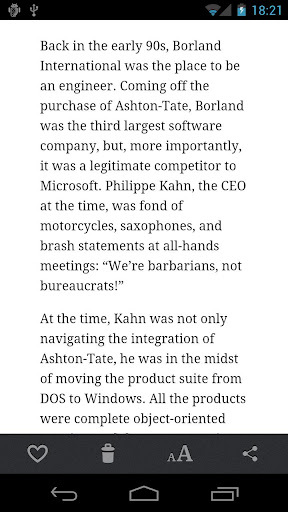 Some of the most successful iOS devs have shunned Android -- publicly and pointedly -- as a matter of principle. Plus, there's the usual moan from some quarters that too few Android users will pay for apps. As a result, the likelihood of an official Instapaper app appeared slim. "Android is not in my world. It's not in my attention span most days. 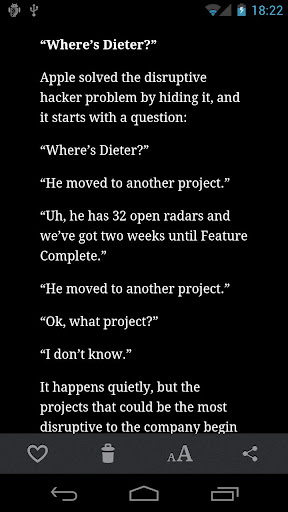 Thinking about the iOS app is a full-time job, and staying competitive on iOS is a full-time job." That's why today's news is worth celebrating. 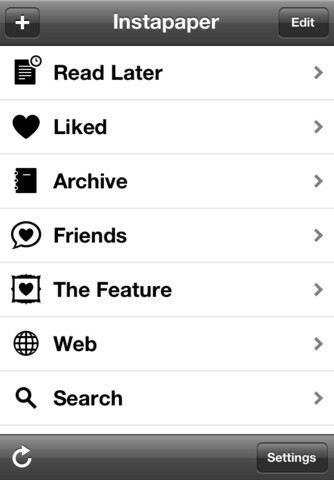 Along with Flipboard and Instagram, Instapaper is among the most sought-after of iPhone's (once-) 'exclusive' apps. Sure, the glaring deficiencies won't sit well with some Android fans. But even if yet again forced to accept the iCrowd's sloppy seconds, here it's a pleasant experience. 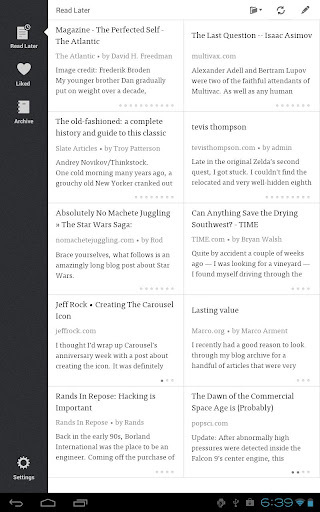 Below is a quick summary of what to expect from Instapaper for Android v1.0. Veteran Instapaper fans might find the changes jarring, but we think the missing bits won't keep you from enjoying the app. The dev promises updates are already in the works -- we're betting that 'full screen' issue gets handled, right quick. Overall, we recommend this app even to Android users with no access to an iOS device. Click the market link below to get your copy of Instapaper for a very fair $2.99 ...that's $2 off the price charged to those famously extravagant iPhone users. Android's reputation as the OS for cheapskates does bring some advantages.